Interscholastic athletics at Trinity-St. John are an important part of educating the total child. Our program exposes students to team activities and provides opportunities for them to learn and gain from the experience of competition that are found on the field and court. It is here and under these conditions that an athlete can put into practice the Christian values and ethics taught in our classrooms and in their church. 1st Corinthians 10:31 tells us, "So whether you eat or drink or whatever you do, do it all for the glory of God." 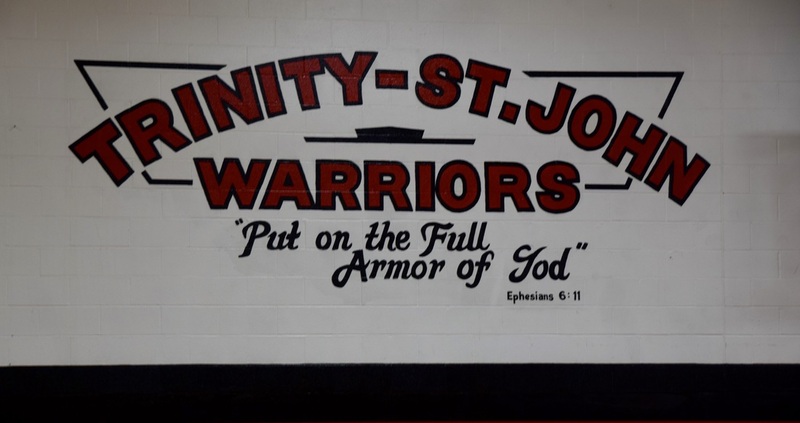 Trinity-St. John, in partnership with the parents, seeks to minister to the student athlete by teaching Christian sportsmanship and instilling the attitude that one can both win and lose with dignity, and without boasting or excuse. Young athletes on the playing field use their God given talents to bring Him glory and honor. By practicing good sportsmanship, an attitude of wanting to do their very best, cooperation and teamwork with fellow team members, self-discipline and dedication, the TSJ athlete makes the statement to everyone watching that they are ultimately on God’s team and they play to win praise for God. The athlete will develop the fundamental skills at the Pee Wee and Pee Wee level through active participation. It is our goal to give all members at these levels a chance for meaningful participation in all games and practices. Those who desire to continue to use their skills at a more competitive level will have the opportunity to do so on our A and B teams. Since the teams our children compete against are schools that have the same general attitude toward interscholastic athletics, we look forward to enjoyable, competitive contests. We expect our players, coaches, and spectators to conduct themselves in a Christian manner at these contests. T-SJ and St. Ann have a Cooperative agreement and form teams together. T-SJ and Immanuel-Okawville have a Cooperative agreement and form teams together. * At the discretion of coaches with consultation with both Athletic Directors, the above categories can be adjusted based on low numbers available in one grade. If 5th grade athletes are needed, all 5th grade athletes will be included on the B team. 5th grade students will not play on the A team. Trinity-St. John Lutheran School integrates the home, school, and church by guiding God’s children, by the power of the Holy Spirit, to see and live all of life from the perspective of Christ and His Word.